WHAT BECAME OF THE CHRISTMAS TREE.—Drawn by C. S. Reinhart.
. "What are those children doing?" asked the clergyman of his wife a few days after Christmas. "I really can not tell you, James," was the reply, as his wife peered anxiously over his shoulder, and out of the window. "All that I know about it is this: I was busy in the pantry, when Rob put his head in, and asked if he could have the Christmas tree, as nearly everything had been taken off of it; so I said 'Yes,' and there he goes with it, sure enough. I do hope the wax from the candles has not spotted the parlor carpet." "Don't be anxious, wife; 'Christmas comes but once a year, and when it comes should bring good cheer.'" "Yes," said the careful housewife, "I suppose I do worry. But there! it is snowing again, and Bertha perched up on that tree on Rob's sled, and she so subject to croup!" "The more she is out in the pure air, the less likely she is to take cold; but where are they going?" "I really do not know, James. Did you ever see a dog more devoted to any one than Jip is to Rob? There he goes, dancing beside him now; and I see Rob has tied on the scarf Bertha knit for him; that is done to please her. She did work so hard to get it finished in time before he came home for the holidays." "She is very like her own dear little mother in kindness and care for others," was the reply. The mother gave a bright smile and a kiss for the compliment, but a little wail from the nursery hurried her out of the room. Christmas at the parsonage had been delightful, for, first of all, Rob's return from boarding-school was a pleasurable event; he always came home in such good spirits, was so full of his jokes and nonsense, and had so many funny things to tell about the boys. Then there was the dressing of the church with evergreens, and the decoration of the parlor with wreaths of holly or running pine, and the spicy smell of all the delicacies which were in course of preparation, for Sally was a famous cook, and would brook no interference when mince-pies and plum-pudding were to be concocted. But the children thought the arrival of a certain box, which was always dispatched from town, the very best of all the Christmas delights. This box came from their rich aunts and uncles, who seemed to think that the little parsonage must be a dreary place in winter, and so, to make up to its inmates for losing all the brightness of a city winter, they sent everything they could think of in the way of beautiful pictures, gorgeous books, games, sugar-plums, and enough little glittering things for two or three trees. Of course the clergyman always laid aside some of these things for other occasions, lest the children should be surfeited. And so Christmas had passed happily, as usual. The school-children had sung their carols and enjoyed their feast, the poor had been carefully looked after and made comfortable, and there had come the usual lull after a season of excitement. It was now the day before the first of the new year, and the parson was writing a sermon. He was telling people what a good time it was to try and turn over a new leaf; to be nobler, truer, braver, than they had ever been before; to let the old year carry away with it all selfishness, all anger, envy, and unloving thoughts;[Pg 78] and as he wrote, he looked out of the window at the falling snow, and wondered where Bob and Bertha could have gone. Dinner-time came. Aunt Ellen, mamma, and the parson sat down alone. "Where are those children?" repeated mamma. "I do not think you need be worried, Kate," said Aunt Ellen. "Rob is so thoughtful, he will take good care of Bertha. They have perhaps stopped in at a neighbor's, and been coaxed to stay." "Very likely," said the parson. And then the baby came in, crowing and chuckling, and claiming his privileges, such as sitting in a high chair and feeding the cat, and mamma had enough to do to keep the merry fellow in order, or his fat little hands would have grasped all the silver, and pulled over the glasses. "I will go look for the children, Kate." "Really, I think you will have to give Rob a little scolding, my dear. He should have told us where he was going." 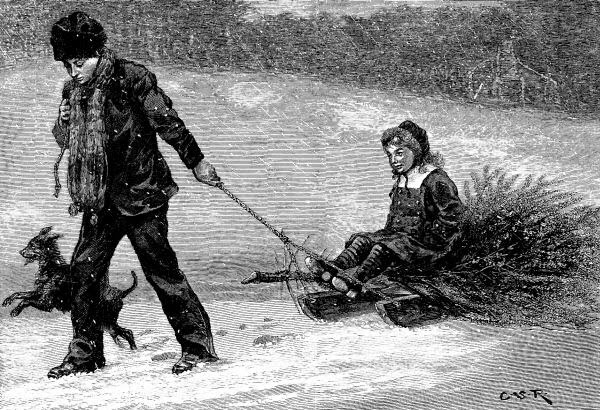 "Yes, I suppose so," said the parson; when just then there was a gleeful cry—a merry chorus made up of Rob's, Bertha's, and Jip's voices, and there they were, Bertha on the sled, and Rob was her horse. "Where have you been, my son?" said the parson, trying to be severe. "You should not have gone off in this manner for the whole day without asking permission." Rob's bright smile faded a little; but Bertha said, quickly, "Please, papa, don't scold Rob. If you only knew—"
"Hush, Bertha!" said Rob; and red as his cheeks were, they grew redder. "I am sorry you are offended, sir. I did not mean to be so long. We were detained." "And where did you get your dinner?" asked mamma. "Oh, we had plenty to eat." "But you don't intend us to know where you got it?" "No, sir," said Rob, frankly. "Now, papa, you shall not scold Rob," said Bertha, putting her hand in his. "Come into your study. Go away, Rob; go give Jip his supper. Come, mamma;" and Bertha dragged them both in to the fire, where, with sparkling eyes and cheeks like carnation, she began to talk: "Mamma, you remember that scrimmage Rob got into with the village boys last Fourth of July, and how hatefully they knocked him down, and how bruised his eye was for a long time?" "Yes, I remember, and I always blamed Rob. He should never have had anything to do with those rowdies." "I didn't blame him; I never blame Rob for anything, except when he won't do what I want him to do. Well, the worst one of all those horrid boys is Sim Jenkins—at least he was; I don't think he's quite so bad now. But he has been punished for all his badness, for he hurt his leg awfully, and has been laid up for months—so his mother says; and she is quite nice. She gave us our dinner to-day. Somehow or other, Rob heard that Sim was in bed, and had not had any Christmas things, and that his mother was poor; and she says all her money has gone for doctor's bills and medicine. And so it just came into his head that perhaps it would do Sim good to have a Christmas-tree on New-Year's Day; and he asked Mrs. Jenkins, and she was afraid it would make a muss, but Rob said he would be careful. And so he carried our tree over, and fixed it in a box, and covered the box with moss, and we have been as busy as bees trying to make it look pretty. And that is what has kept us so long, for Rob had to run down to the store and get things—nails and ribbons, and I don't know what all. And Sim is not to know anything about the tree until to-morrow. And please give us some of the pretty things which were in our box, for we could not get quite enough to fill all the branches. Rob spent so much of his pocket-money on a knife for Sim that he had none left for candy; for he said the tree would not give Sim so much pleasure unless there was something on it which he could always keep." Here little Bertha stopped for want of breath, and looked into the faces of her listeners. The parson put his arm around her as he said, "I hardly think we can scold Rob now, after special pleading so eloquent as this; what do you say, mamma?" "I say that Rob is just like his father in doing this kindly deed, and I am glad to be the mother of a boy who can return good for evil." The parson made a bow. "Now we are even, madam, in the matter of gracious speeches."